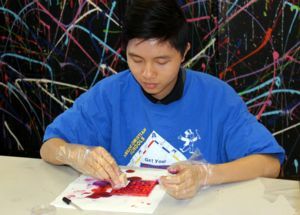 Art is taught as an enrichment class for Pre-K through fifth grade or an elective for grades six through twelve. Elementary artwork is on continuous display around campus in the elementary office, classrooms, and library. All secondary students involved in art may have their best works chosen to display at Fine Arts Night. Secondary students create a portfolio and may choose to compete in TCSIT (Texas Christian Schools Interscholastic Tournament) held at ACU in April.